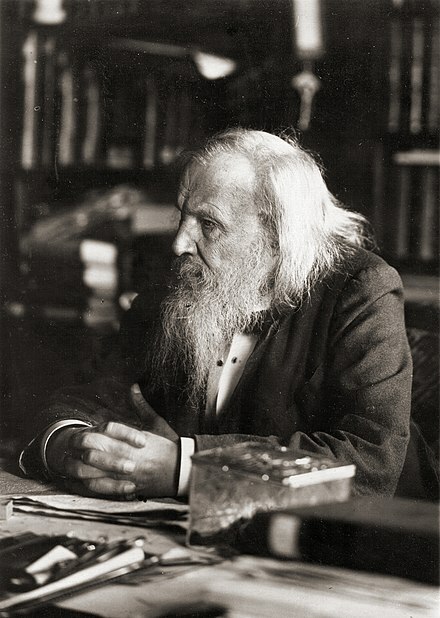 Dmitri Mendeleev was first to publish a recognizable periodic table in 1869, developed mainly to illustrate periodic trends of the then-known elements. He also predicted some properties of unidentified elements that were expected to fill gaps within this table. Most of his forecasts proved to be correct. Mendeleev's idea has been slowly expanded and refined with the discovery or synthesis of further new elements and by developing new theoretical models to explain chemical behaviour. The modern periodic table now provides a useful framework for analyzing chemical reactions, and continues to be widely adopted in chemistry, nuclear physics and other sciences. All elements ranging from atomic numbers 1 (hydrogen) to 118 (oganesson) have been either discovered or synthesized, completing the first seven rows of the periodic table. The first 94 elements exist naturally, although some are found only in trace amounts and were synthesized in laboratories before being found in nature. [n 1] Atomic numbers for elements 95 to 118 have only been synthesized in laboratories or nuclear reactors. The synthesis of elements having higher atomic numbers is currently being pursued: these elements would begin an eighth row, and theoretical work has been done to suggest possible appearances for this extension. Numerous synthetic radionuclides of naturally occurring elements have also been produced in laboratories. 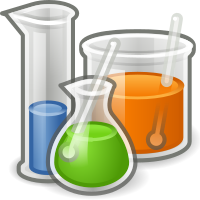 Chemistry (IUPAC) in December 2015. Their proposed names, nihonium (Nh), moscovium (Mc), tennessine (Ts) and oganesson (Og) respectively, were announced by the IUPAC in June 2016 and made official in November 2016. The first 94 elements occur naturally; the remaining 24, americium to oganesson (95–118), occur only when synthesized in laboratories. Of the 94 naturally occurring elements, 83 are primordial and 11 occur only in decay chains of primordial elements. No element heavier than einsteinium (element 99) has ever been observed in macroscopic quantities in its pure form, nor has astatine (element 85); francium (element 87) has been only photographed in the form of light emitted from microscopic quantities (300,000 atoms). Grouping methods Groups Main article: Group (periodic table) A group or family is a vertical column in the periodic table. Groups usually have more significant periodic trends than periods and blocks, explained below. Modern quantum mechanical theories of atomic structure explain group trends by proposing that elements within the same group generally have the same electron configurations in their valence shell. Consequently, elements in the same group tend to have a shared chemistry and exhibit a clear trend in properties with increasing atomic number. In some parts of the periodic table, such as the d-block and the f-block, horizontal similarities can be as important as, or more pronounced than, vertical similarities. 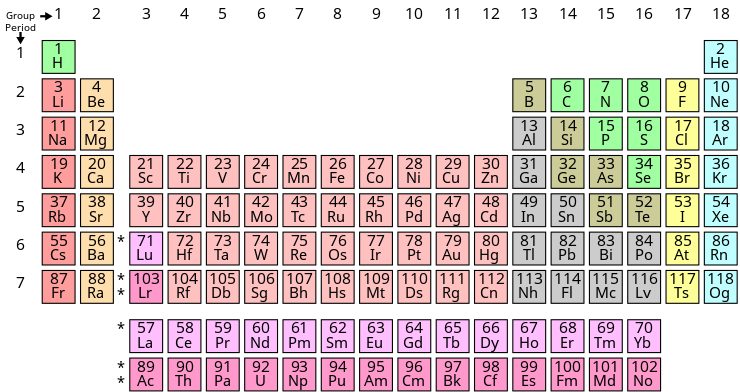 Under an international naming convention, the groups are numbered numerically from 1 to 18 from the leftmost column (the alkali metals) to the rightmost column (the noble gases). Previously, they were known by roman numerals. In America, the roman numerals were followed by either an "A" if the group was in the s- or p-block, or a "B" if the group was in the d-block. The roman numerals used correspond to the last digit of today's naming convention (e.g. the group 4 elements were group IVB, and the group 14 elements were group IVA). In Europe, the lettering was similar, except that "A" was used if the group was before group 10, and "B" was used for groups including and after group 10. In addition, groups 8, 9 and 10 used to be treated as one triple-sized group, known collectively in both notations as group VIII. In 1988, the new IUPAC naming system was put into use, and the old group names were deprecated. Some of these groups have been given trivial (unsystematic) names, as seen in the table below, although some are rarely used. Groups 3–10 have no trivial names and are referred to simply by their group numbers or by the name of the first member of their group (such as "the scandium group" for group 3), since they display fewer similarities and/or vertical trends. Elements in the same group tend to show patterns in atomic radius, ionization energy, and electronegativity. 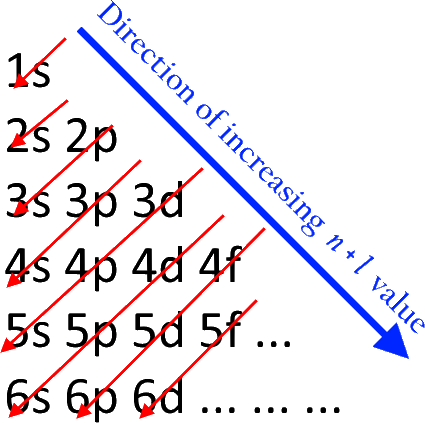 From top to bottom in a group, the atomic radii of the elements increase. Since there are more filled energy levels, valence electrons are found farther from the nucleus. From the top, each successive element has a lower ionization energy because it is easier to remove an electron since the atoms are less tightly bound. Similarly, a group has a top-to-bottom decrease in electronegativity due to an increasing distance between valence electrons and the nucleus. There are exceptions to these trends: for example, in group 11, electronegativity increases farther down the group. Hydrogen (H), while placed in group 1, is not considered to be part of the alkali metals. Madelung rule or energy ordering rule, as shown in the diagram. 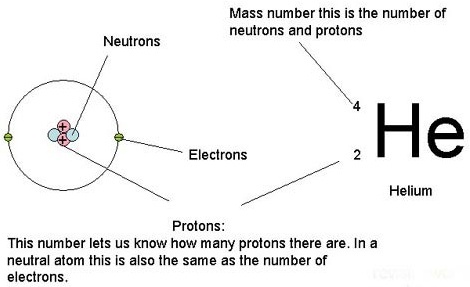 The electron configuration for neon, for example, is 1s2 2s2 2p6. 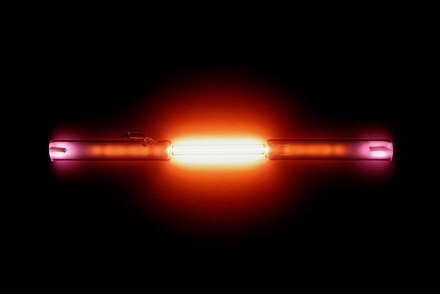 With an atomic number of ten, neon has two electrons in the first shell, and eight electrons in the second shell; there are two electrons in the s subshell and six in the p subshell. In periodic table terms, the first time an electron occupies a new shell corresponds to the start of each new period, these positions being occupied by hydrogen and the alkali metals. 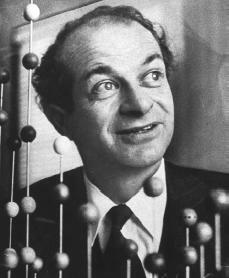 Johann Wolfgang Döbereiner observed that many of the elements could be grouped into triads based on their chemical properties. Lithium, sodium, and potassium, for example, were grouped together in a triad as soft, reactive metals. Döbereiner also observed that, when arranged by atomic weight, the second member of each triad was roughly the average of the first and the third; this became known as the Law of Triads. German chemist Leopold Gmelin worked with this system, and by 1843 he had identified ten triads, three groups of four, and one group of five. Jean-Baptiste Dumas published work in 1857 describing relationships between various groups of metals. Although various chemists were able to identify relationships between small groups of elements, they had yet to build one scheme that encompassed them all. In 1857, German chemist August Kekulé observed that carbon often has four other atoms bonded to it. Methane, for example, has one carbon atom and four hydrogen atoms. 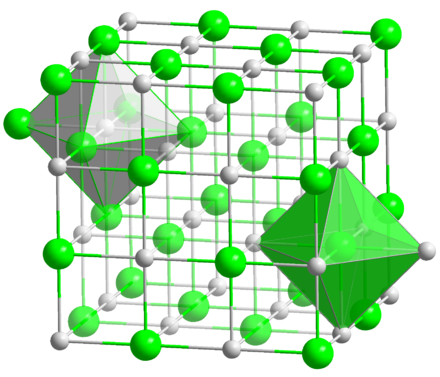 This concept eventually became known as valency; different elements bond with different numbers of atoms. In 1862, Alexandre-Emile Béguyer de Chancourtois, a French geologist, published an early form of periodic table, which he called the telluric helix or screw. He was the first person to notice the periodicity of the elements. With the elements arranged in a spiral on a cylinder by order of increasing atomic weight, de Chancourtois showed that elements with similar properties seemed to occur at regular intervals. 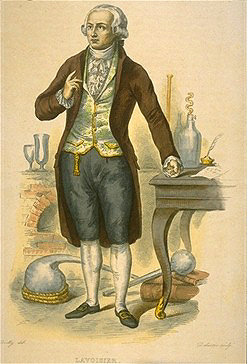 His chart included some ions and compounds in addition to elements. His paper also used geological rather than chemical terms and did not include a diagram; as a result, it received little attention until the work of Dmitri Mendeleev. In 1864, Julius Lothar Meyer, a German chemist, published a table with 44 elements arranged by valency. The table showed that elements with similar properties often shared the same valency. Concurrently, William Odling (an English chemist) published an arrangement of 57 elements, ordered on the basis of their atomic weights. With some irregularities and gaps, he noticed what appeared to be a periodicity of atomic weights among the elements and that this accorded with "their usually received groupings". Odling alluded to the idea of a periodic law but did not pursue it. He subsequently proposed (in 1870) a valence-based classification of the elements. In 1871, Mendeleev published his periodic table in a new form, with groups of similar elements arranged in columns rather than in rows, and those columns numbered I to VIII corresponding with the element's oxidation state. He also gave detailed predictions for the properties of elements he had earlier noted were missing, but should exist. These gaps were subsequently filled as chemists discovered additional naturally occurring elements. It is often stated that the last naturally occurring element to be discovered was francium (referred to by Mendeleev as eka-caesium) in 1939. 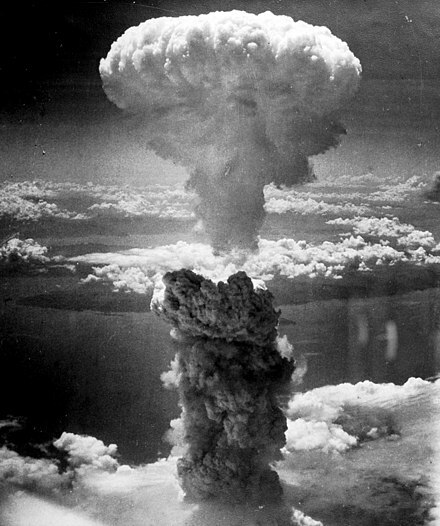 Plutonium, produced synthetically in 1940, was identified in trace quantities as a naturally occurring element in 1971. The popular periodic table layout, also known as the common or standard form (as shown at various other points in this article), is attributable to Horace Groves Deming. In 1923, Deming, an American chemist, published short (Mendeleev style) and medium (18-column) form periodic tables. [n 7] Merck and Company prepared a handout form of Deming's 18-column medium table, in 1928, which was widely circulated in American schools. By the 1930s Deming's table was appearing in handbooks and encyclopaedias of chemistry. It was also distributed for many years by the Sargent-Welch Scientific Company. With the development of modern quantum mechanical theories of electron configurations within atoms, it became apparent that each period (row) in the table corresponded to the filling of a quantum shell of electrons. 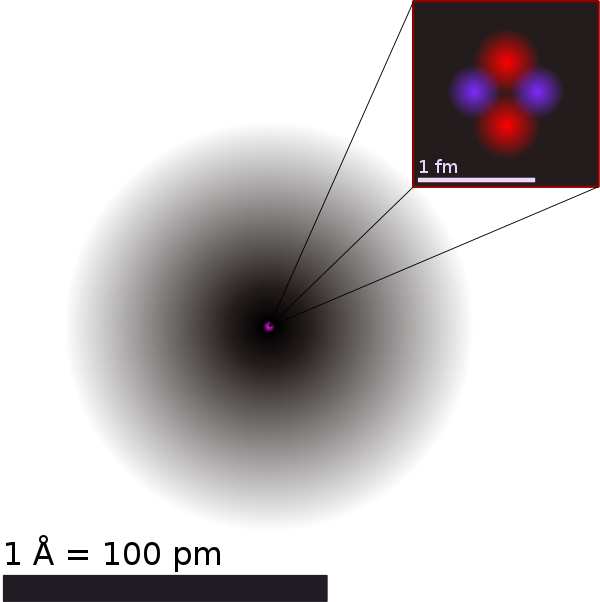 Larger atoms have more electron sub-shells, so later tables have required progressively longer periods. The modern periodic table is sometimes expanded into its long or 32-column form by reinstating the footnoted f-block elements into their natural position between the s- and d-blocks. Unlike the 18-column form this arrangement results in "no interruptions in the sequence of increasing atomic numbers". The relationship of the f-block to the other blocks of the periodic table also becomes easier to see. Jensen advocates a form of table with 32 columns on the grounds that the lanthanides and actinides are otherwise relegated in the minds of students as dull, unimportant elements that can be quarantined and ignored. Despite these advantages the 32-column form is generally avoided by editors on account of its undue rectangular ratio (compared to a book page ratio), and the familiarity of chemists with the modern form (as introduced by Seaborg). Tables with different structures Main article: Alternative periodic tables Within 100 years of the appearance of Mendeleev's table in 1869 it has been estimated that around 700 different periodic table versions were published. As well as numerous rectangular variations, other periodic table formats have been shaped, for example,[n 9] like a circle, cube, cylinder, building, spiral, lemniscate, octagonal prism, pyramid, sphere, or triangle. Such alternatives are often developed to highlight or emphasize chemical or physical properties of the elements that are not as apparent in traditional periodic tables. Eric Scerri as disregarding the need to display chemical and physical periodicity. Somewhere in the middle of the continuum is the ubiquitous common or standard form of periodic table. 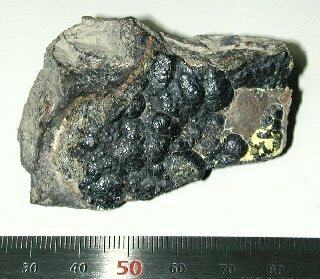 This is regarded as better expressing empirical trends in physical state, electrical and thermal conductivity, and oxidation numbers, and other properties easily inferred from traditional techniques of the chemical laboratory. Its popularity is thought to be a result of this layout having a good balance of features in terms of ease of construction and size, and its depiction of atomic order and periodic trends. Bohr model is inaccurate when applied to such an element. Chemistry (6th ed.). Lexington: D. C. Heath and Company ^ Karol (2002, p. 63) contends that gravitational effects would become significant when atomic numbers become astronomically large, thereby overcoming other super-massive nuclei instability phenomena, and that neutron stars (with atomic numbers on the order of 1021) can arguably be regarded as representing the heaviest known elements in the universe. See: Karol P. J. (2002). "The Mendeleev–Seaborg periodic table: Through Z = 1138 and beyond". Journal of Chemical Education 79 (1): 60–63. ^ Scerri, one of the foremost authorities on the history of the periodic table, favoured the concept of an optimal form of periodic table but has recently changed his mind and now supports the value of a plurality of periodic tables. Chemistry World. Royal Society of Chemistry. Archived from the original on 21 October 2012. Retrieved 30 September 2012. ^ Eisberg, R.; Resnick, R. (1985). Quantum Physics of Atoms, Molecules, Solids, Nuclei and Particles. Wiley. ^ Bjorken, J. D.; Drell, S. D. (1964). Relativistic Quantum Mechanics. McGraw-Hill. ^ Greiner, W.; Schramm, S. (2008). "Resource Letter QEDV-1: The QED vacuum". American Journal of Physics. 76: 509. doi:10.1119/1.2820395. , and references therein. ^ Sella, Andrea (7 August 2013). "An elementary history lesson". New Scientist (2929). Archived from the original on 3 July 2016. Retrieved 13 June 2017. ^ Scerri, Eric (9 August 2013). "Is there an optimal periodic table and other bigger questions in the philosophy of science". ericscerri23.blogspot.com.au. 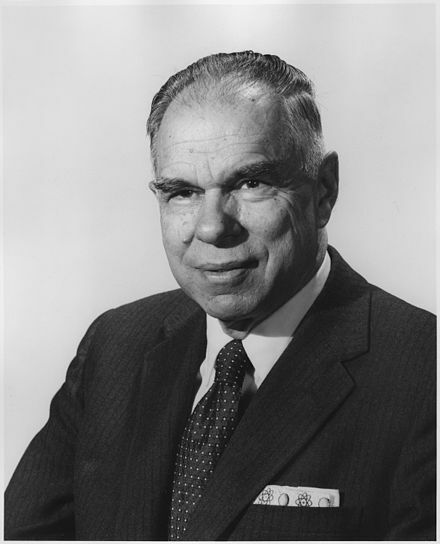 Eric Scerri. Archived from the original on 13 June 2017. Retrieved 4 September 2013. For Dummies (1st ed.). New York: Wiley Publications. ISBN 978-0-7645-5430-8. Scerri, E. (2007). The periodic table: Its story and its significance. Oxford: Oxford University Press. ISBN 0-19-530573-6. Scerri, E. (2011). The periodic table: A very short introduction. Oxford: Oxford University Press. ISBN 978-0-19-958249-5. Venable, F. P. (1896). The Development of the Periodic Law. Easton, Pennsylvania: Chemical Publishing Company. OCLC 776059614.